Cariloha is a new addition to our Gaslamp Quarter in San Diego that is bringing a sustainable lifestyle to you. It’s a one stop shop for your basic sustainable needs, with everything manufactured from unique bamboo fibers. There is a wide selection of bamboo clothing and accessories for men, women, children, and even your home! Their bamboo bed sheets are as soft and luxurious as cashmere or silk and are just one reason to shop at Cariloha. You shouldn’t have to sacrifice sustainability for comfort and style, because you’re sacrificing a lot more than your wallet. Times are changing and so is the fabric. In the last few years more and more eco-conscious businesses have been popping up, utilizing more environmentally-friendly materials and socially responsible methods of production. Organic fibers or sustainable fabric like bamboo can reduce the amount of chemicals you bring into your life. In the fashion world, there is so much focus on the next big thing that it becomes easy to forget the benefits of natural resources in their organic forms. Many resources use gas guzzling tractors and herbicides to harvest before production, which isn’t good for anyone. Luckily, there has been a rise in sustainable fabrics made from organic fibers. A number of fashion designers are using fabrics made from organic cotton, wool, hemp, and even bamboo. Bamboo is one of the most abundant resources on the planet and doesn’t need pesticides, herbicides, or fertilizers to grow or harvest. “Bamboo apparel features several qualities that make it a superior fabric. It’s twice as soft as cotton and keeps you a few degrees cooler. It’s naturally antibacterial, hypoallergenic, and helps prevent skin odor and skin irritation,” says Rodrigo Lagunas, manager of the new San Diego location. Walking into Cariloha, I was immediately attracted to their wall of silky bed sheets and bamboo tote bags, but I was more impressed with the knowledgeable staff. I was encouraged to feel how soft the bamboo fabrics were and had a chance to explore the store. When I asked Rodrigo about the layout, he told me it was designed for interaction and education about their bamboo products. “We encourage all visitors to touch and feel the bamboo-soft difference of our shirts, bed sheets, towels and hand bags. We are also hoping people enjoy the party atmosphere we try to bring to our store. It’s an experience with great customer service and great quality products that bring people back over and over again.” The atmosphere was unquestionably upbeat and fun, but it also meshed well with the tranquil color scheme. If I had to sum up Cariloha in a few words, organized and clean come to mind. It was one of my better shopping experiences. I loved the great layering tanks, tees, and sweaters; and the fabulous tote bags, skin-pleasing sundresses, and fun accessories already had me thinking about summer! Don’t worry fellas; there is plenty for you to choose from too. There is a wide selection of button ups and polos for happy hour or that casual Friday at work. And for the kids, they have ultra soft graphic tees. With a warmer season just around the corner, make sure to stock up on SPF and some extra face protection with a bamboo herringbone hat. “Of course we are excited about our shirts, polos, dresses, and crazy soft socks, but what I love the most is our bed sheets! They are as soft as silk without the downside of silk sheets. The bamboo bed sheets are breathable, machine washable, and softer than 1000 thread count Egyptian cotton!” added Rodrigo. It is remarkable and very unique to feel that soft quality throughout all of their merchandise. I’ve never experienced that in a store before. It reflects the impeccable quality of bamboo fabric. Don’t miss out on the total Cariloha experience and walk through a store that is designed for you to touch the merchandise. Stop in and take advantage of their great Valentine’s Day special and get 10% off bed sheets or $10 off bamboo towel sets all month long. While you’re there, check out their spring line for men, women, and kids! 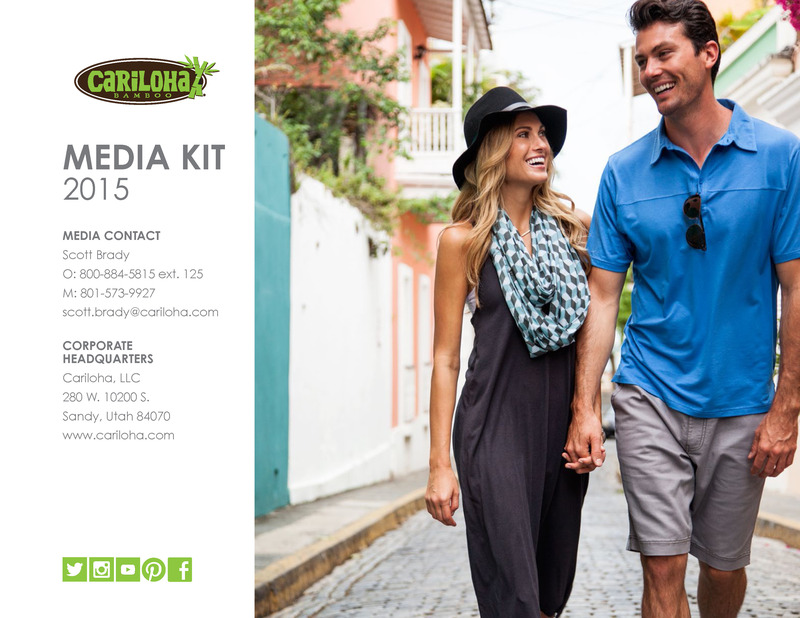 In addition to great deals, Cariloha also has an Athletic Fit line that will make its debut in March. So make it easy on yourself and the environment; shop Cariloha bamboo apparel this season and take a step in the right direction.